In this post, I offer a calculated transition state and IRC for this reaction, to see what insights might accrue. How was this obtained? At the ωB97XD/6-311G(d,p)/SCRF=water level. This procedure would allow for any dispersion-like effects to be allowed for in the π-π-stacking. The rearrangement is normally promoted by acid, and the active species is thought to be diprotonated‡ (although monoprotonated catalysis is also observed. Here I report just the diprotonated route, together with chloride anions to balance the charges, and have added a continuum water field to allow this double ion-pair to be at least partially stabilised. The rate determining step is the N-N cleavage/C-C bond formation. This is followed by presumed rapid proton transfers, which are not modelled here. The [5,5] transition state for the benzidine rearrangement. Click for 3D. This [5,5] transition state is 2.9 kcal/mol lower in ΔG‡298 than the transition state for the isomeric [3,3] rearrangement. 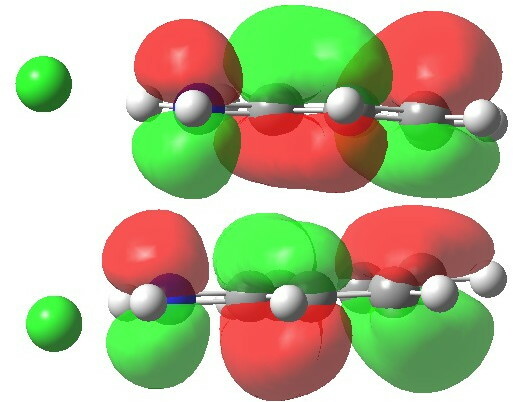 The NCI (non-covalent-interactions) shows the forming C-C bond to be on the border of covalent, and non-covalent (blue), but that the π-π-stacking region is all weakly attractive (green). 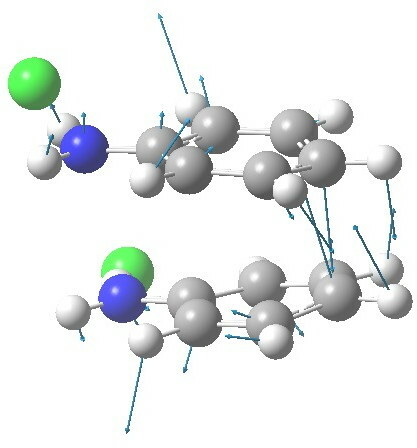 You can also observe the strong hydrogen bonds between the chloride anion and an N-H group (blue), and the weak attractive zones between the two nitrogen centres, between the chloride and the ortho-C-H hydrogens, and even between the two chloride anions (blue-green or green). I should point out that the initial position for these anions was over the aryl ring, but they migrated to the NH region during optimisation of the transition state. Calculated electrostatic potential. Click for 3D. 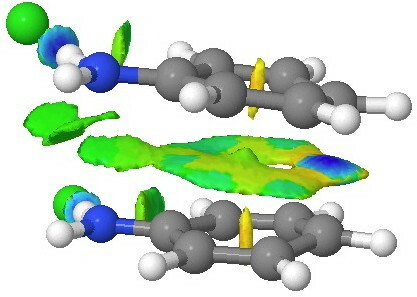 The highest-occupied molecular orbital shows the two bonds involved in the [5,5] shift (N-N and C-C) are both bonding, but more significantly, the central region of the two stacked aryl rings is also bonding. This is a clear manifestation of a π-complex, which the benzidine rearrangement has often (and it has to be said controversially) described as, and which elevates this particular reaction from that of a simple bond forming/bond cleaving sigmatropic. Another way of looking at it is that secondary orbital interactions (such as often invoked in Diels-Alder cycloadditions) are exceptionally important here. HOMO for 5,5 benzidine rearrangement. Click for 3D. 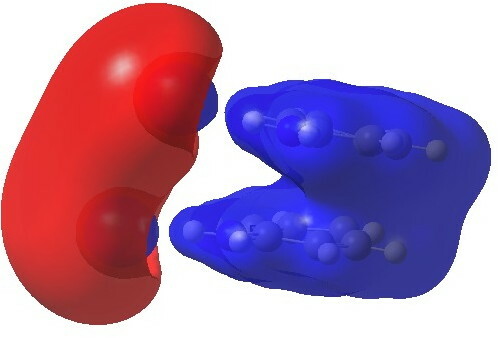 The LUMO is strongly antibonding in that region; indeed adding two electrons to form a 12-electron process would be strongly destabilising. In this regard, this unusual sigmatropic reaction follows the same 4n+2 electron rule as more conventional ones. The next two diagrams illustrate the competing (higher energy) [3,3] shift, which also has some π-complex character. A [3,3] alternative to the benzidine rearrangement. Click for 3D. 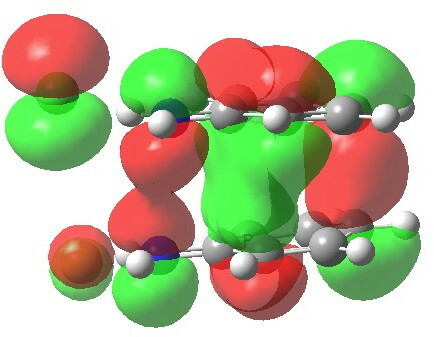 NCI surface for 3,3 rearrangement. Click for 3D. I will end with three autobiographical notes. The benzidine rearrangement was one of the earliest reactions I did in my home laboratory, at the age of about 13. As I recollect, I prepared about 1.5 grams (blissfully ignorant of how carcinogenic it is), and used it via diazotization to couple to phenol. My fascination with chemistry most certainly started with colour (and how to express the bonding in nitric oxide). About eight years later, I was about to commence my Ph.D. studies. The objective was to use kinetic isotope effects to infer the structure of transition states. In my case (proton transfers to indoles) I never did achieve this objective. 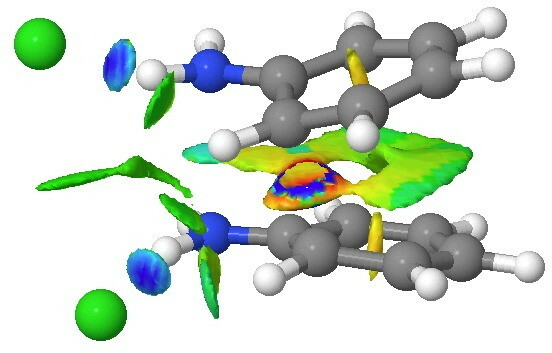 But it is noteworthy that the mechanism of the benzidine rearrangement was largely unravelled using such isotopic studies. By 1974 as a post-doctoral researcher, I had moved on to studying mechanisms using quantum theory and had decided that it was easier to invert the use of isotope effects by predicting a transition structure using this method, and then seeing if the computed isotope effects matched the experiment. We did this for the Diels-Alder reaction and more generally, and then for some gas-phase eliminations, this latter being my first entirely independent publication. So, putting all this together, one might infer that armed with a computed transition state structure for the benzidine rearrangement, it is trivial to compute the kinetic isotope effects and hence to see if they correspond to those measured. You might expect a report on this in a future post here. 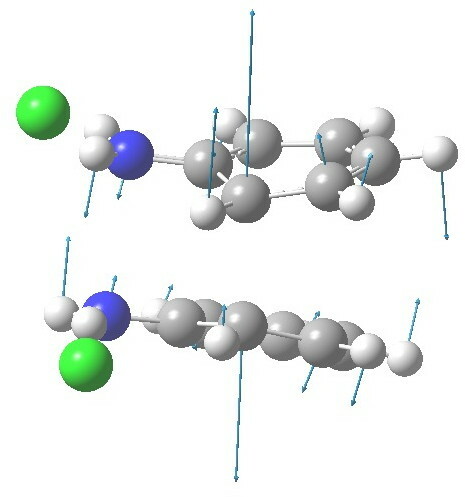 ‡ Crystal structures of diprotonated dimethyl hydrazines show a N-N bond length of ~1.45Å (typical counter-anions being nitrate, perchlorate or sulfate). That calculated for the diprotonated diphenyl hydrazine is ~2.5Å, which suggests that with the phenyl group, electrons from the N-N region may be borrowed to contribute to the π-π-complex. This entry was posted on Sunday, January 6th, 2013 at 5:35 pm and is filed under Interesting chemistry. You can follow any responses to this entry through the RSS 2.0 feed. You can leave a response, or trackback from your own site. The mechanism of the Benzidine rearrangement. is licensed by Henry Rzepa under a Creative Commons Attribution-Noncommercial-Share Alike 3.0 United States License.